Abbott, Andrew, The System of Professions. An Essay on the Division of Expert Labour, University of Chicago Press, Chicago et Londres, 1988. Abramovay, Miriam et Maria Rua, Violência nas escolas, Unesco, Brasilia, 2002. Aeby, Gaëlle et Marc-Antoine Berthod, « Entrer et sortir des institutions (introduction) », Tsantsa, n° 16, 2011, p. 6-17. Ainsworth, Mary D., Mary C. Blehar, Everett Waters et Sally Walls, Patterns of Attachement: A Psychological Study of the Strange Situation, Lawrence Erlbaum, Hillsdale, 1978. Alain, Marc, Raymond Corrado et Susan Reid, Implementing and Working Under the YCJA Across Canada: A View from the Ground, University of Toronto Press, Toronto, 2015. Alvim, Maria Rosilene et al., Da violência contra o « menor » ao extermínio de crianças e adolescentes, NEPI/CBIA, Rio de Janeiro, 1992. Amster, Randall, Street People and the Contested Realms of Public Space, LFB Scholarly Publishing LLC, New York, 2004. 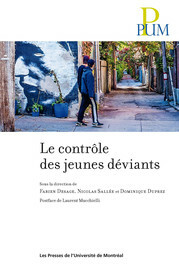 Bibliographie générale In : Le contrôle des jeunes déviants [en ligne]. Montréal : Presses de l’Université de Montréal, 2015 (généré le 21 avril 2019). Disponible sur Internet : <http://books.openedition.org/pum/3823>. ISBN : 9782821895492. DOI : 10.4000/books.pum.3823. Duprez, Dominique, et al., (dir..) “Bibliographie générale”. Montréal : Presses de l’Université de Montréal, 2015. (pp. 239-256) Web. <http://books.openedition.org/pum/3823>.